As portable devices such as Android powered smartphones, BlackBerries, Windows Phones, iPads and other tablets have increased in popularity with gadget hungry consumers the demand for games and apps has grown at an astonishing rate. As the power of handheld devices has increased so it has become possible for developers to match on the small screen the same quality players expect from the casino games they play on their desktop or laptop computers. Currently, mobile casinos offer are a relatively small amount of casino games to play compared to the hundreds of titles that you can find at the online casinos however development teams are hard at work and racing to be first to market with new titles. With Video Pokers, blackjack and roulette being some of the most popular games with players it's only a matter of time until the major mobile casinos are offering many different versions of these games. Below we take a look at the different devices you can use to access Video Pokers and other casino games. The Appple iPhone continues to be the most desired smartphone amongst consumers with the latest iPhone 4 proving to be another big hit for Apple. Playing Video Poker on your iPhone 4 (or older models such as the iPhone 3G) frees you from the desktop computer and if you own one of these phones you know just how seductive and addictive these devices can be. Being such a massive seller guarantees that Casino software developers and Online Casinos certainly will not be neglacing iPhone users anytime soon - you can expect a huge range of iPhone casino games, including Video Pokers, to be available for this platform in the not too distant future. 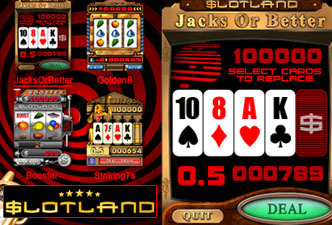 You can play Video Poker for free or real money on your iPhone with developers such as Microgaming and Slotland offering Video Pokers such as Jacks or Better that you can download to your iPhone and try out within seconds. Android phones continue to increase their share of the smartphone market with manufacturers bringing out bigger, better and faster models at a rapid rate. Android powered phones are a great tool for playing casino games on the go and owners of popular phones such as the HTC Wildfire, Samsung Galaxy s3, LG Optimus and similar are spoilt for choice when it comes to which mobile casinos to play at. Remember when a "CrackBerry" was the must have handset and looked like becoming the dominant force in mobile devices? While there's no doubt that the arrival of popular upstart Android and the sheer glamour and desirabilty of Apple's iPhones have stolen some of BlackBerries' thunder in recent years but RIM continue to put up a good fight for their share of the lucrative smartphone market and with 2011 and 2012 seeing a number of successful releases such as The Curve 9360 BlackBerry Bold 9900 and the arrival of the Blackberry Playbook 2.0 on the scene in June 2012 it'd be foolish to write these guys off just yet. BlackBerry phones are well catered for by the mobile casinos so there's certainly no need to miss out on the casino games and apps enjoyed by your iPhone or Android owning friends. Perhaps the dark horse in the mobile platform race Windows 7 phones are rapidily gaining in popularity with consumers and professionals alike and 2012 should see a number of interesting developments from Microsoft and phone manufacturers not least the much anticipated release of Windows 8 (codenamed Apollo). The latest Windows Phones enjoy the support of casino software developers such as Microgaming and it's a great platform on which to play casino games and Video Poker. Straddling the divide between smartphones and laptops, tablets have become one of the most desirable gadgets of recent years thanks in no small part to the boffins at Apple who almost single-handledly created the demand for these touchscreen devices. The iPad 3 is already in the shops, of course, just a few years after the release of the original iPad and it's hard to imagine now but there was initially much sceptism from the technology and computer industry insiders that there was a desire or even need for something like the iPad. Well we can't live without our tablets now and certainly lounging around playing casino games on our iPad 2 is a time well spent, in our opinion! If you're the owner of an iPad, Android or Windows tablet or a BlackBerry Playbook or similar you can enjoy casino gaming wherever you are. Don't worry if you haven't got the latest all-singing, all-dancing iPhone or Android phone yet - older mobile phones are still often plenty powerful enough and ready to play JAVA powered casino games and your phone will most likely be supported by mobile casinos especially if it is from one of the main manufacturers such as Nokia, Motorola, or Samsung. 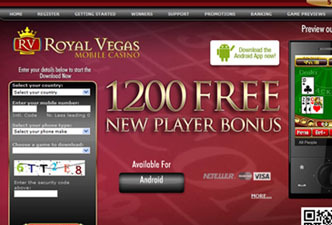 Mobile casinos will present some kind of list or drop down menu from which you can select your make and model. We've been testing mobile casinos to determine which ones offer the best combination of casino game choice and bonus offers and promotions. We've looked at casinos powered by the major software developers such as Microgaming and Slotland who develop the best mobile video poker for US players at the moment. Microgaming powered casinos are a popular choice with UK players. At this moment in time Jacks or Better Video Poker is on offer at all Microgaming Casinos and Aces and Faces and Deuces Wild Video Poker games were released in late 2011 and available at a selection of mobile casinos.